Global Action Platform is the field catalyst and regional lead for the Tennessee Global Innovation Hub--Nashville, a regional collective impact initiative to connect the area's universities, investment funds, and business leadership in a strategy for growing an innovation hub with global markets in Middle Tennessee. Urban solutions for providing for the nutrition, health, and economic opportunity of cities will be tested and modeled here and elsewhere to accelerate broad economic prosperity. Global Action Platform builds its model on over ten years of applied practice in regions, drawing on concepts from Michael Porter, Bruce Katz, and original research on how cities can prepare for the world's growing urban population. Global Action Platform provides best practice research and neutral community facilitation to implement effective models and strategies that cities can implement. 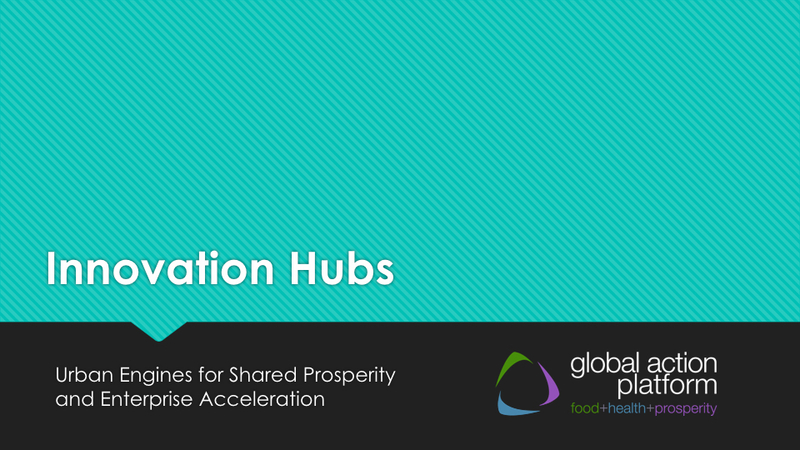 The Global Action Platform innovation hub model can be implemented by any city to help and solve the the growing need for urban solutions as the world grows to 10 Billion in 2050 and 75% of the population migrates into cities. Global Action Platform serves as the neutral convener and collective impact facilitator for the creation of an innovation hub with global markets in Nashville, and in other communities and regions around the nation and world. With ten R1-R3 research uiniversities, growing capital markets and invesdtment funds, and a strong entrepreneurial culture and history, Middle Tennessee is poised to become a global center for creativity and innovation. Global Action Platform has proven itself to be an effective convener for great minds, investors, researchers, and NGO leaders, who intend to develop and implement urban solutions for nutrition, health, and shared prosperity. In every community in every country, we bring a singular message, that lives are improved when engaged leaders work together to create solutions for abundant food, health and prosperity.